The Catholic Diocese of Davenport announced an agreement Thursday to pay $9 million to settle 37 claims by people who say priests sexually abused them as children. Bishop William Frankin of the Davenport Catholic Diocese announces a $9 million settlement in a lawsuit against the diocese in a news conference Thursday. Behind him is the plaintiffs' attorney Craig Levien, who respresents 37 victims who claim sexual abuse by priests in the diocese. The settlement concludes a month of negotiation and mediation during which the diocese said it would either settle or file for bankruptcy — but wouldn’t allow the first lawsuit’s trial to begin Monday. It ends more than a year of legal battles in all but one of 15 lawsuits filed against the diocese since May 2003, but not before the bishop made severe staff and service cutbacks at the diocese headquarters. 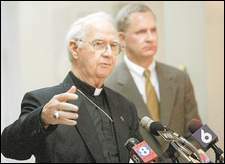 Bishop William Franklin, in an afternoon news conference with plaintiffs’ attorney Craig Levien, expressed a deep apology to the victims and the Catholic community. “It is my hope that this settlement will help foster healing and forgiveness as well as help us to focus together on preventing this from ever happening again,” Franklin said. Levien said the victims have waited for years for vindication, validation, support and closure. “That wait is not over, but starting today, the wait will be shorter,” Levien said at the news conference. The 36 men and one woman he represents, some of whom filed lawsuits in Scott, Clinton and Lee counties in Iowa and one in California, claim the diocese knew of sexual abuse by priests but reassigned those priests without warning parishioners, thus allowing children to be abused. The settlement covers four priests and one former priest named in the lawsuits — the Rev. Francis Bass, the Rev. William Wiebler, the late Rev. Theodore Geerts, Vicar General Monsignor Drake Shafer and James Janssen. Among the 37 claims were cases involving about six other priests who have not been named by the diocese or in lawsuits, Levien said. Franklin said the settlement makes it “much more likely” the diocese will release the names of the other accused priests. Janssen and the priests have denied the allegations in court records. Levien said the diocese is dismissed from the lawsuits, but he still plans to pursue the lawsuits against the individual priests starting Monday. The $9 million payment — an average of $243,243 per claimant — will be made in a lump sum from diocesan funds and insurance proceeds, the diocese and attorneys said. Franklin refused to disclose how much would come from diocese coffers, and Levien did not disclose a range for the payments to individual claimants. Those amounts will be determined on the provability of the allegations and damages to each individual such as costs of mental-health treatment. The largest total settlement regarding sexual abuse by priests — $85 million for 552 claimants, or an average of $153,986 per claimant — occurred in the Boston Archdiocese in 2003. Thursday’s Davenport settlement also included the diocese agreeing to measures to enhance its efforts to protect children now and in the future, Franklin said. Franklin said he cannot understand, explain or justify the decisions that were made years ago that allowed such priests to continue to serve. Statements in court records from plaintiffs, eight of whom filed only as “John Doe,” contained sordid and lurid tales of their sexual contact with priests from 20 to 50 years ago. Those affidavits state priests had sexual contacts with the plaintiffs, including naked card parties, masturbation contests between boys and fondling an altar boy while entering the church for Mass. Allegations arose from parishes across the 22-county diocese covering southeast Iowa, mainly following the accused priests from assignment to assignment. The pope removed Janssen from the priesthood after diocese documents and reports showed the allegations followed Janssen — who was suspended twice for treatment in the 1950s — to numerous eastern Iowa parishes during his 56-year career. The diocese attorneys attempted to have several of the cases dismissed before coming to trial, citing a statute that bars old cases from being filed. They pursued that argument to the Iowa Supreme Court, which this week denied the request to appeal a decision by District Judge C.H. Pelton to allow those cases to go to a jury trial. Franklin said he couldn’t detail how those cases would be handled when brought forward in the future because the settlement came together in just one week. The bishop announced last week that the diocese headquarters will reduce to 18 a staff that numbered 44 two years ago because a portion of an investment fund — which provides a portion of operating expenses for services to the parishioners of southeast Iowa — will be depleted to compensate victims. The Diocese had $6 million invested in the fund last year, according to an audited financial statement published in The Catholic Messenger. Franklin said the details of any future decisions on cutting services will be made later by staff based on what they consider absolutely necessary. “And then they have to make the sad decision, what services will they not provide, what will they not give,” he said. Franklin talked frequently this month about the possibility of bankruptcy — taken by only one diocese and one archdiocese in the nation. In September, he called all parish leaders to Iowa City and told them the diocese might file for bankruptcy because it does not have adequate financial resources to compensate the claimants. Those whose jobs were cut from the diocese are also victims, he said. Levien said the victims saw the greater good in standing together in support of each other. Todd Ruger can be contacted at (563) 383-2493 or truger@qctimes.com.